There comes a time in a poker players life when everything looks like a deck of cards. I personally haven't experienced that kind of thing because I lose more games than I'd like to remember but I'm sure somebody out there with a love of poker has come to that point. Now if it comes to a point where all that traditional poker games are getting a little too boring you might want to try something like Poker Drop to keep things a little fresh without losing your love of poker. It's kind of like your regular tetris game but you get to use a deck of cards rather than the regular bricks you're used to. All you have to do is create hands horizontally or vertically based on the cards you're given. Like the traditional poker game it's easy to pick up and play but with ten levels of difficulty you'll probably spend a couple of days to actually master it. 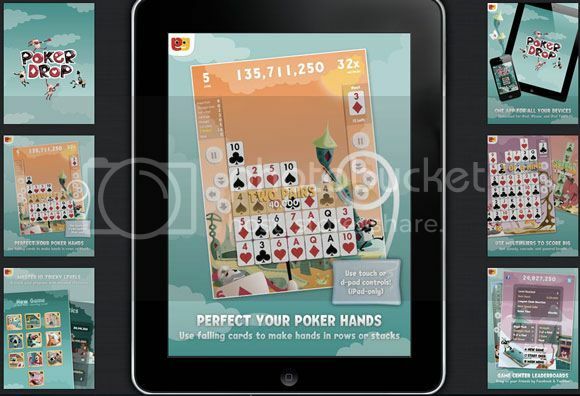 You can go ahead and download Poker Drop from the iOS App Store and take your love of poker to another fun game!